As requested by 'nickynooch', here's my Skin/Theme that I've been working on for the last few hours, lol. This will constantly be a WIP until I'm totally happy with it. Feel free to send me ideas on how to improve it. Here's a few screenshots and a vid for ya. - Optimized for 1280x720 (Widescreen) but also includes 640x480 and 1024x768 resolutions. Let me know if there are any other resolutions that you want in. - There's about 13 emulator screens left to do. I don't know if i'm gonna try make/hunt down all the remaining logos. - Custom CPS3 and Zinc logos, changed Genesis to Mega Drive (since I'm English, lol). I've put in the Sega AM2 logo for the Model 2 emulator (bit of a pain to find a good image of, lol) and also recreated the Ultra 64 logo (for those who actually use this emulator). - I've put a loading screen in there for people that actually use it. - Ripped and edited the 'Capcom Virtual Sound' Jingle which was used in many of their arcade games around the mid '90s. This is used as the start up jingle. 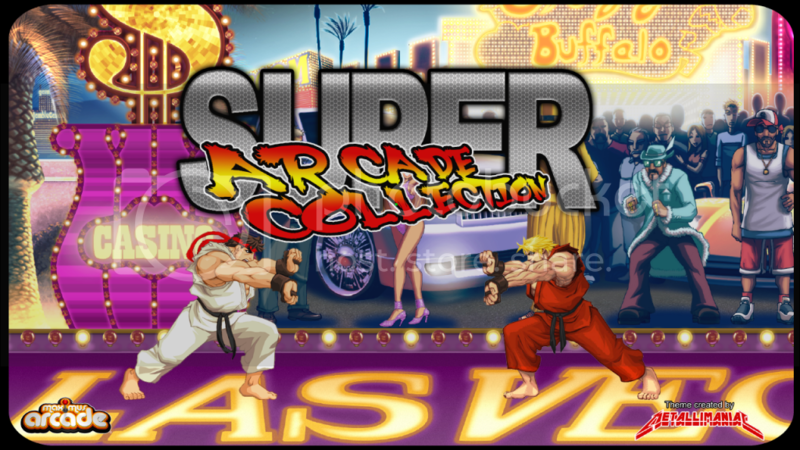 - Ripped menu sounds from Street Fighter IV and Super Street Fighter II Turbo HD Remx. - Used the Health Bar from SSFIITurboHDRemix as the 'Rom Bar'. - Street Fighter IV styled arrow for emulator selection screen. - To whoever created the 'SF2HDRemix' theme for AtomicFE as I used the Ryu image from that and also edited the black boxes to fit MA needs. - Mameseer for the 'Maximus Arcadius' theme as I'm still using the arrow cursors and emulator logos from that theme. Gorgeous theme for any street fighter fan. Cool to see a street fighter theme like this since there is are a couple good mortal kombat themes out there too! You can get passed it depending on how much of a Street Fighter fan you are, lol. I wanted it to be more generic at first, but a friend suggested Street Fighter and it works well with other games thrown in there. just download the .zip file and place it in the skins folder of Maximus Arcade. No need to unzip it either. Then just load up the preferences, click on the Interface tab and change the Interface theme.